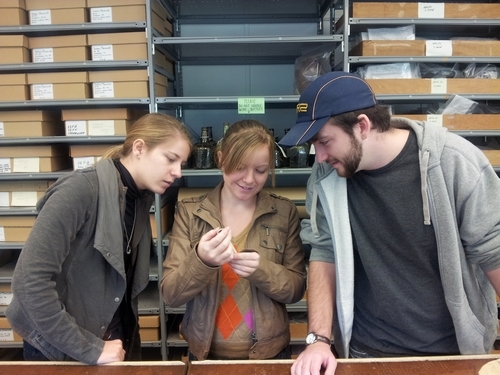 Olivia, Ashley, and Allen examine a smoking pipe from CWF. On Monday, November 4, 2013, I traveled across space from the Virtual Curation Laboratory in Richmond, Virginia, to the Colonial Williamsburg Foundation (CWF) Archaeological Laboratory in Williamsburg, Virginia. 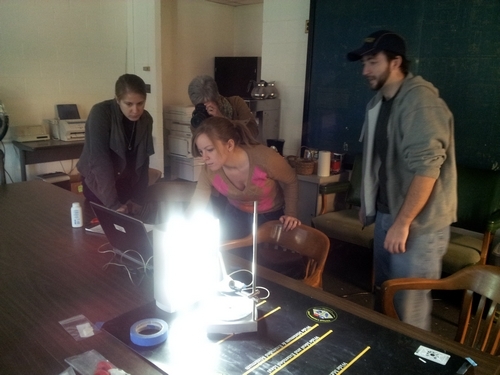 Accompanying me were VCU students and Virtual Curation Laboratory personnel Allen Huber, Olivia McCarty, and Ashley McCuistion–and the NextEngine Desktop 3D scanner. 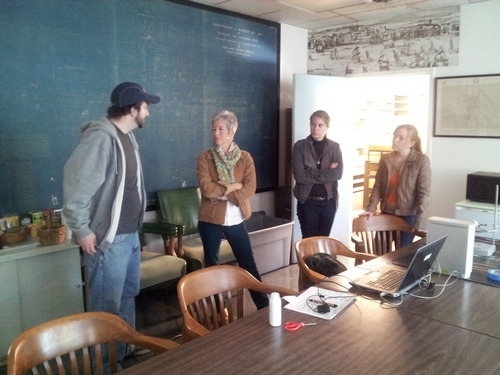 CWF Staff Archaeologist Meredith Pool discusses archaeology at Williamsburg with the Virtual Curation Laboratory staff. After arriving, we met with CWF Staff Archaeologist Meredith Poole, who was interested in having us create 3D digital models of items excavated archaeologically in Colonial Williamsburg over the decades and representing centuries of human (and non-human) occupation. The 3D digital artifact models are to be used for research and public archaeology purposes. 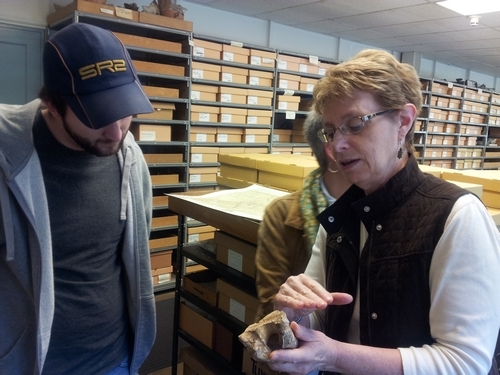 Our access to the collections was facilitated by CWF Associate Curator for Archaeology Kelly Ladd-Kostro. Because our time was limited, we focused on two smoking pipes and the skull of dog, affectionately known as “Albert.” One of the smoking pipes dated to the 17th century, and was recovered from Carter’s Grove. The other pipe dated to the 18th century and its exact provenience is unknown as it was recovered prior to the beginning of modern archaeology at Williamsburg. We ended our day of scanning at the CWF Archaeological Laboratory in the afternoon with the aforementioned skull of Albert. Albert was recovered through archaeological excavation at the Peyton Randolf House site from a 19th century context. Albert was clearly a beloved family pet, as evidenced by his old age and worn teeth. He certainly could not have survived to an advanced age without care and attention from a concerned family member. CWF Curator of Zooarchaeology discusses butchery marks with Allen Huber. While in the CWF Archaeological Laboratory, we very fortunately were able to meet and speak with Joanne Bowen, CWF Curator of Zooarchaeology. Zooarchaeology is one focus of research in the Virtual Curation Laboratory and our cyberspace extension at the Virtual Curation Museum. We discussed with Joanne the potential of using 3D scanning of butchered animal remains for teaching and research purposes, and she arranged for a loan of three butchered cattle bones: a left humerus and a right radius/ulna from the Peyton Randolph House site; and, a left humerus from the Armoury site. Incidentally, CWF is opening the James Anderson’s Blacksmith Shop and Public Armoury to the public in the middle of this month. 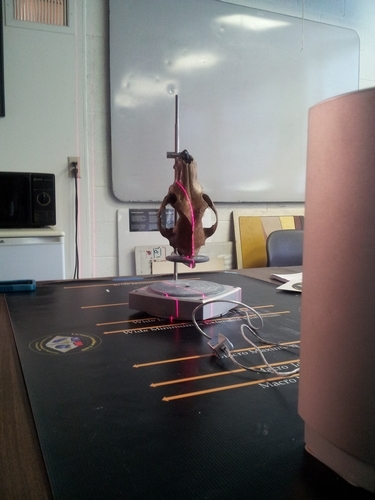 We certainly look forward to our next trip to Colonial Williamsburg and the opportunity to 3D scan some of the other objects in their collection.